Birthplace : Flushing, New York, U.S.
Chamique Shaunta Holdsclaw (also known as: Chamique Holdsclaw) , born August 9, 1977 in Flushing, New York, United States is an African-American basketball player. When Chamique Holdsclaw was named the number-one draft pick of the Women's National Basketball Association (WNBA) in 1999, the event marked just another milestone in the career of one of America's top athletes. Holdsclaw was named WNBA Rookie of the Year for her record with the Washington Mystics and went to the Sydney, Australia, Olympics in 2000 as a member of the women's team for the United States. In her biography, Chamique: On Family, Focus, and Basketball, written with Washington Post reporter Jennifer Frey, Holdsclaw writes of her life in the projects of Queens, where she and her brother, Davon, were raised by her grandmother, June, from the time Holdsclaw was eleven and Davon eight. "Boys groaned when she followed them onto the blacktop," wrote Charles Hirshberg in Sports Illustrated. "She shrugged off their taunts, partly because she was such a terrific player and partly because she had bigger problems." The brother and sister had been removed from their home by child protection workers, but with their grandmother they received the nurturing that turned their lives around. Davon eventually moved back with his mother, but Holdsclaw stayed with June, listing her name in her University of Tennessee bio instead of that of her parents. "That Holdsclaw survived such a childhood is admirable," wrote Carolyn T. Hughes in the New York Times Book Review, "as is the fact that she credits her grandmother for helping her do it." Holdsclaw attended Christ the King High School in Queens, where the basketball team subsequently won four consecutive state championships, with a record of 106-4. In her Astoria neighborhood, Holdsclaw's nickname was "Flat Out," because she would flat-out drop everything in order to play basketball. Now when Holdsclaw visits the old neighborhood, everyone greets her. Life contributor Priya Giri wrote that "she's an icon on the streets, a large shadow at the playgrounds--but the calls come mainly from adolescent girls. For them, Holdsclaw is a new kind of hero--one of their own, from the public-school courts, who signifies that it's not just the boys who can soar. Girls can dream hoop dreams too." Grandmother June, originally from Alabama, wanted her granddaughter to attend college in the south, closer to her roots, and particularly to play for legendary coach Pat Summitt at the University of Tennesee, and her wish was granted. Holdsclaw's unprecedented career at the University of Tennessee in Knoxville included three national championships for her team, the Lady Vols, as well as school records for Holdsclaw, who scored 3,025 career points and had 1,295 career rebounds. Dana Gelin wrote in Sports Illustrated that Holdsclaw "has maintained a humble charm even as she has become the toast of Knoxville. She seems incapable of saying anything vaguely flattering about herself without punctuating the sentence with a self-conscious laugh. She comes across as mature and confident for a nineteen-year-old, but if you made her repeat that assessment back to you, she couldn't do it with a straight face." In reviewing Holdsclaw's biography in Black Issues Book Review, contributor Fred R. Lindsey declared that "through it all, she proves an inspiration, especially for young readers." Holdsclaw graduated as the University of Tennessee's all-time leading basketball scorer of either gender. Frequently compared to Michael Jordan, the six-foot, two-inch Holdsclaw wore Jordan's number, twenty-three, but she picked it not because it is worn by the greatest men's player, but in honor of her favorite Psalm, the Twenty-third, which begins: "The Lord is my shepherd, I shall not want." Knoxville, also home of the Women's Basketball Hall of Fame, honored their star by renaming a street on the campus of the University of Tennessee. Now Chamique Holdsclaw Drive runs through it. 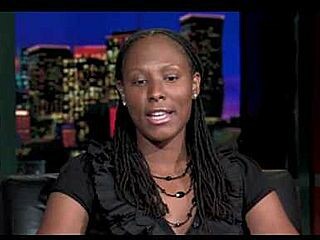 Family: Born August 9, 1977, in Queens, NY; daughter of Willie and Bonita Holdsclaw. Education: University of Tennessee--Knoxville, B.A., 1999. First Team All-American, Associated Press, 1996-97, 1997-98, 1998-99; Women's Basketball Player of the Year, Associated Press, 1997-98, 1998-99; Women's College Basketball Player of the Year, ESPY, 1997-98, 1998-99; Female Athlete of the Year award, Southeastern Conference, 1997-98; Female Athlete of the Year, ESPY, 1998-99; Preseason All-American, 1998-99; Consensus Preseason National Player of the Year, 1998-99; Preseason SEC Player of the Year, 1998-99; Honda-Broderick Cup Award, Most Outstanding Female Athlete, NCAA, 1998; Sullivan Award, Nation's Best Amateur Athlete, 1998-99; Player of the Year award, U.S. Basketball Writers Association, 1999; number-one draft pick, WNBA, 1999; Naismith Award for Women's Player of the Century; U.S. Women's Olympic Team, 2000 Olympics, Sydney, Australia; four-time Kodak All-American. Professional basketball player. Washington Mystics, player, 1999--. Sports correspondent for the Nickelodeon network. * (With Jennifer Frey) Chamique: On Family, Focus, and Basketball, Scribner (New York, NY), 2000. View the full website biography of Shaunta Holdsclaw.